I would be remiss to start this blog with anything other than a massive sigh of relief. That’s the Patriots team I know and love. The offensive looked crisper than my refrigerator drawer. The defense looked competitive, tightening up in the red area when we had to. I think this will help all the arm chair GMs in New England calm down and remember that our season doesn’t even start until the AFCCG. But this isn’t a recap, this a feature piece. And today, with a plethora of great options to talk about, I’m going to focus on something a little less positive. And that would be the shiny new toy on the Patriots offense, essentially our first round pick, Brandin Cooks. Cooks has already played three years in the NFL, yet he’s only 23 years old. Entering 2017, the seasoned veteran is younger than Malcolm Mitchell! Think about that. Cooks began to produce instantly. After being selected 20th overall by the Saints, he played 10 games as a rookie. He put up 53 catches for 550 yards and 3 tuddies. The next two years he raised his game to the elite level. In 2015, he had 84 catches for 1138 yards and 9 tuddies. He followed that up last year with 78 catches for 1173 yards and 8 tuddies. With his 4.3 speed, he can stretch the field, but he can also run the full route tree. Drew Brees showered him with praise and tightly spiraling footballs during his time in bayou, and the possibilities seemed endless when pairing Cooks with Tom Brady. So here’s one thing I don’t fully understand about the NFL. I don’t accept that someone could be “not ready” when it comes to a new playbook. If you are Flip Dorsett and you joined the team 4 seconds before kickoff in week 1, fine. Of course you don’t know the language and rhythm of Tom’s offense. But if you were with the team all offseason I don’t respect you if you aren’t on the same page by week 1. The first time this idea was even put on my radar was during the Ocho Stinco experiment. I think he might have been a healthy scratch during week 1 because he didn’t know the playbook yet. I don’t remember Randy Moss needing to take regular season weeks off because he didn’t know what routes to run. I’m not saying Cooks is Ocho Cinco. He’s been working his tail off, and he was ready to go week 1. That’s not a given, considering Tom is one of the hardest guys in the league to gain his trust, so I give Cooks credit for that. Tom has been as impressed as Brees was, per his comments to the press. But Cooks certainly hasn’t been Randy Moss either. That doesn’t seem like a fair comparison on paper or on the measuring stick you have on the wall of your childhood house, but we all heard that talk when we traded for him. The Patriots haven’t had a game changing receiver like this since Moss! The Patriots finally have their elite wide out! With the way we have drafted at that position over the last decade, I am/was fully in support of brining in a proven wide receiver instead of taking a chance on someone at the end of the first round. I mean, with the pick we traded them for Cooks, the Saints took Ryan Ramczyk, tackle out of Wisconsin. He proceeded to take a holding penalty and get his pants pulled down by Deatrich Wise, our fourth rounder. So I’m good with Cooks. I don’t want givesies backsies. BUT… I’d be lying if I said I didn’t expect a little bit more so far. In week 1, Cooks went for 3 catches and 88 yards, including a 54 yard DIME from Tom, which was the exact type of play everyone was envisioning when we traded for him. He also drew two or three (more?) defensive holding/PI penalties that helped move the ball and can’t be over looked. It was a good debut for an exciting player. But I still felt like some impact was missing. Maybe it was the beat down we were taking in the second half that soured my impression, but he didn’t seem to rise up when we needed it. The offense was stalling, the team wasn’t showing much fight. 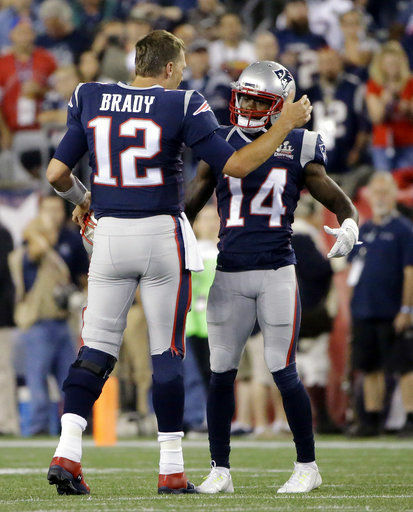 It’s times like that I’d love to see a guy with Brandin Cooks’ ability to start making some game changing plays. That’s what I thought he was here for. Today he did even less. I wrote before the game I’m sure the Saints were going to give him safety help on every play, so don’t expect him to be running free down field very often, if ever. So I’m not going to gun him for not having a huge game. But 2 rushes for 6 yards and 2 catches for 37 yards? Puke. He was only targeted 4 times and the 2 misses were drops according to me. Probably a little harsh but I thought they were catchable. Admittedly the 22 yarder he caught was basically the one time the Saints didn’t have help over the top and Cooks was free for a tuddy. Brady under threw an easy score and Cooks did a good job of coming back for the ball to secure the big gain. But my concern is why he isn’t getting more involved. Sure, the Saints were bracketing him. I’m not saying I need him to be busting 40 yard bombs up the sideline all game. What I do need is for him to take what the defense is giving us. He’s an elite receiver. Run routes that get you open when there is a high safety over the top of you all day. Crossing patterns, WR screens, come back routes, slants. Cooks can wheel. Get the ball in his hands with green grass (synthetic turf) in front of him. Now some of this might fall on Josh and the game plan. Maybe we are trying to keep him healthy. Maybe he doesn’t like running those routes. Maybe him clearing out the secondary with post-corners and go routes benefits the offense more because of what it opens up for everyone else. I just think being on pace for 40 catches is not a great return on my investment.